Changes in production and supply systems, increasing distances and low load factors (empty runs still account for around 30 % of total vehicle-km) have resulted in a doubling of tonne-km between 1970 and 1997, with the largest annual growth in road (4 % on average) and short-sea shipping (3 %). Freight transport is shifting increasingly towards road: trucking now accounts for 45 % of total freight transport (30 % in 1970). While the Communitys freight transport action plans have resulted in a better performance of short-sea shipping, they have not yet reversed the decline in shares of rail and inland waterways. Reduce the link between economic growth and freight transport demand. Improve the shares of rail, inland waterways, and short-sea shipping modes. Tonne-km carried by each transport mode (road, rail, air, inland waterways, sea). Note: Adjusting this indicator by GDP provides a possible measure of transport intensity  passenger-km relative to GDP. This indicator can monitor progress in reducing the coupling between economic activity and transport demand. Freight transport demand is closely connected to changes in the volume and structure of economic activity. Changes in industrial structures, production/distribution organisation and logistics (including just-in-time delivery), have also increased demand. The strong growth in road transport results from its speed and flexibility in meeting such changes, and also its ability to service out-of-town factories and shopping centres. Even when other modes are used, road transport is often needed for the initial and final stages of the journey to the point of loading or unloading. Rail has become less and less attractive, because of the decline in quality and flexibility offered. These trends are further enhanced by the continuing investment in road transport infrastructure over rail and inland waterways (see Indicator 13). The Communitys freight strategy focuses mainly on the promotion of intermodal and combined transport, the revitalisation of railways, inland waterways and shipping. The trans-European transport network is again a main element in this strategy. No quantified EU targets for freight transport demand or modal split have been established, and only a limited number of Member States have set targets. 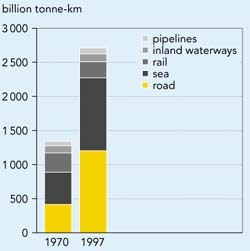 Total annual tonne-km increased by 102 % over the period 1970-1997, an average annual increase of 2.6 %. Over the same period, GDP (at 1990 constant prices) grew at an average of 2.5 % per year. In the periods 1979-1985 and 1990-1993 the growth in freight transport was low or negative, reflecting the economic climate. The main growth in freight tonne-km has been in the transport of wood, paper pulp, chemicals, and manufactured products such as glass and ceramics, and machinery. The largest increases have been road (4.0 % per year) and short-sea route shipping (3.1 % per year). Rail transport has declined by 0.6 % per year, while pipeline and inland waterways have grown a little (1.0 % and 0.4 % per year respectively). On the other hand, the total tonnage carried has increased less rapidly than tonne-km, because average distances travelled have increased. Growth in freight transport has been especially pronounced in Greece and Portugal. Both countries have more than tripled the total tonne-km carried since 1970 and they remain among the Member States with the largest rates of increase. On the other hand, tonne-km in Ireland has increased only slightly since 1970, and has remained on the same level over the past decade. Between 1970 and 1997 the share of road haulage rose significantly from 31 to 45 %. Short-sea shipping rose from 35 to 39 % and is the only other mode of transport, which has increased its share. 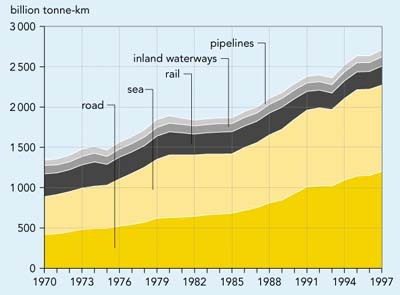 The change in modal choice from 1970 to 1997 shows a long-term trend towards roads at the expense of rail and inland waterways. Austria and Sweden are the only Member States where a significant share of freight transport is carried by rail. In both countries more than one-third of freight is transported by rail. While traditional rail has been declining, combined road/rail transport has shown significant growth rates in recent years (7 % per year from 1985-1996). Already, according to DG Transport, about 50 bn tonne-km or 23 % of total tonne-km of EU rail freight is carried on combined road/rail services. Combined transport also represents a high share of rail freight in Italy (40 % of total tonne-km), Spain (34 %) and the Netherlands (30 %). Increasing intra-EU trade and internationalisation has also led to an increase in the share of international freight tonne-km, mainly by sea and road transport. International transport accounts for 50 % of total tonne-km (and 10 % of total transported tonnes). Transit traffic (i.e. traffic that crosses a certain country but has a destination and origin in another different country) represents 7 % of EU land transport performance (see Box 2.2). Under the EEAs business as usual scenario a 50 % increase in tonne-km by 2010 is expected (over 1994). This would mainly arise from an increase in international freight movements. Rails share in overall demand is expected to increase slightly, particularly for long distances, as a result of encouraging combined road-rail transport. Transit freight is concentrated on relatively few routes, all of which have very high transport volumes. It is a particular problem in the Alpine region where a large proportion of international freight traffic passes through especially sensitive areas, and where transit transport has increased substantially during recent decades. Austria saw a tenfold increase in transit freight transport across the Brenner Pass between 1960 and 1996 and at the same time the road/rail market shares were almost reversed. In 1960 the market share for rail was 87 %, but by 1996 it was down to just 30 %. A shift of transit road freight to rail transport is therefore an essential cornerstone of the Austrian environment and transport policy. To achieve such a shift requires measures at the trans-national level. One of the instruments Austria is using to abate NOx emissions from fright transport is the eco-point system. This started in 1992 (as agreed in Austrias Accession Treaty) and aims to reduce emissions by 60 % by the year 2003. Annually a limited number of eco-points are attributed to each country in the Community. Each heavy goods vehicle (weighing more than 7.5 tonnes, and registered in the Community) has to pay a number of eco-points for each transit trip through Austria. The number of eco-points depends on the emission characteristics of the truck and the distance travelled. An interim evaluation of the eco-point system was made by the Commission in 1998. This shows that the system is effective: average NOx emissions from trucks fell by 27 % in four years and total emissions from transit are declining. Of course there is no evidence that such improvement is due solely to the eco-point system, but it can be assumed that the system has provided an important incentive. A next review of progress towards the target will be made (by the Commission and the EEA) in January 2001. Depending on the findings of this evaluation the system can be continued for an extra three years. More work is needed to develop reliable and comparable statistics on tonne-km by modal split and type of goods carried. Note: The data has been drawn from the DG Transport statistics pocketbook (version 1999). This combines data from Eurostat, the European Conference of Ministers of Transport (ECMT), and other sources, together with additional data supplied by the Member States. For references, please go to https://www.eea.europa.eu/publications/ENVISSUENo12/page015.html or scan the QR code.